This is one fun app! Tiny Robot Maker from Sydney based, Tiny Twiga Studios is a new app (released on 5 Feb), where you can create your own fun robots. How does it work? You create your robot by combining different parts – head, body, antennae (hair), arms, legs, face, body decorations etc. Each part is selected in turn by swiping it onto the screen and you can swap parts around as you are creating. With all the different options you could easily come up with 1000s of different robot combinations. Once your robot is finished it is saved in the Robot Gallery, which holds your 50 most recent robots. 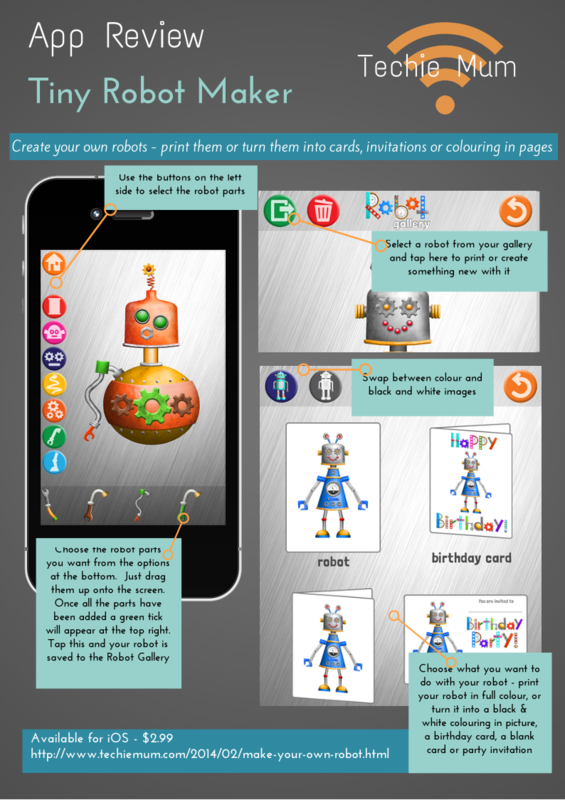 From the Robot Gallery you have the option of printing it as an A4 full colour picture; a black and white colour-in picture; turning it into a birthday party invitation, a birthday card or a blank card. Tiny Robot Maker is aimed at 3 to 6 year olds. Although I think I’d stretch that a bit – on the day I downloaded it my 12 year old was home sick. When I got home from work that afternoon his first words were “Mum, I found the robot app – it’s really fun!”. He then gave me a tour of the app, which was interrupted by his 10 year old brother snatching the iPad so he could also have a go. Of course, they then wanted me to try it - and it really is fun! So don’t be surprised if you find older family members creating funny robots too. Tiny Robot Maker is available for iPad and iPhone from the App Store for $2.99. Also, good news – there’s no advertising and no in-app purchases.